Since it was my birthday on the day of the rally, where I would normally be standing around getting cold helping run the event. I thought I would enter the rally. Suze my usual nav would be busy sorting out the media for the event, with great coverage in MN, Autocar and on TV on MotorsTV. So I drafted in Lizzie Pope for the day. The day started off with us (and everyone else) searching for grip even with the winter pattern road tyres which are designed to work well in the very cold and damp conditions. With 77 starters we were very pleased to be lying 39th overall at the end of the first stage beating cars like Civic VTi’s and 4×4 EVO’s and Scoobies. Perhaps my years of working at the Brands Hatch Rally school were paying off as I instantly clicked back in to where the grip was(and wasn’t) around the ultra slippery rallyschool section of the stage. The rest of the morning was spent searching for grip in the non-track sections and coping with the changing grip out on the main circuit. Then during lunch we could see our other rivals in the class and sub-class challengers (limited mods 1400’s) had made up time on us during the last stage before lunch. We knew they were running sticky Hankook slicks, so the signs were there that a change of tyres would needed. So we bolted on the worn Yoko 048R’s, and even though it started to snow a little on the start line of the next stage after less than a mile it was clear that these were the right tyre. 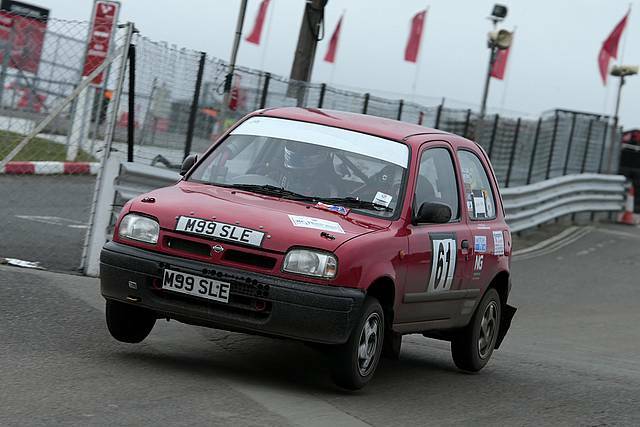 They offered a lot more grip, although there was still a few moments getting sideways heading into Paddock Hill bend……. By the start of the last stage we knew we had a decent amount of time over Mark & Carl behind us in the class and quite a gap to the next in class. So we headed in to the last we the aim to a) finish and b) to have some fun! We made great use of the handbrake throughout the stage with a fair amount of show-boating (or other word(s) you might choose!) and although we lost a few seconds we had great fun. We finished the day 45th overall, 5th in class and 1st of the limited modified 1400’s. Here is the only on-board video of the day as the camera decided not to play ball in the cold…. This entry was posted in Uncategorized on January 25, 2013 by projectmicra.